I’m a picture book junkie. I love them truly, madly and deeply, and believe they are for everyone. Babies — They can drool on the edges. Toddlers — They can sit in a lap, help turn the pages and listen. Beginning readers — They can sound out words or call out refrains. Kids — They can read the stories themselves. Middle schoolers, high schoolers and college students — They can find reassurance or a focused summary of practically any topic. Adults — They can revel in beautiful language. Or smile or snort or sigh. That’s why I was beyond thrilled when I stumbled across a blog by educator Pernille Ripp — that’s her to the right — about how picture books are an integral part of her seventh-grade classroom. Yup, you read that right. Seventh grade. 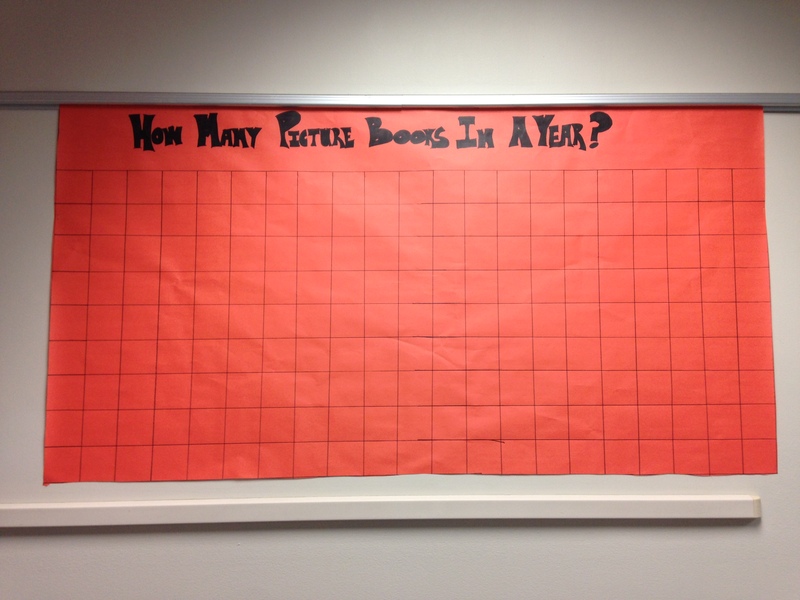 Pernille has a bulletin board that tracks the number of picture books her class reads in a year. Another showcases the covers of books she personally read over the summer. A third tracks the overall number of books read in class. Take a break for a moment and check it out. You’ll be impressed. So, I sent her some questions, and she most graciously responded. What initially got you interested in using picture books with older students? We needed to laugh more! We needed books that would offer us a reprieve from everything going on in our classroom and the world, and we needed stories that gave us a way into difficult-to-understand situations. Picture books provided us with that and more, and so it became our thing. When I moved to seventh grade, I knew picture books were something I couldn’t give up because I needed students to believe that reading could be fun. Picture books give us a way to reconnect with the early-on love of reading, while still developing our minds. How do you use them with your class? We use them for many things — as a way to build community, as a way to discuss life lessons, as a way to understand history. We use them to learn how to be better writers and readers, how to comprehend texts, how to be inspired. Picture books are a foundation in our classroom, and I also use them sometimes because we just need a moment to breathe. What tips do you have for other teachers or librarians who would like to use picture books with middle-schoolers? To do it! To embrace picture books with everything they have, to get connected with others so you can find out which picture books are amazing and then purchase them for your classroom. Start the very first week with sharing a picture book — it is the very first thing we do in our classroom — and watch the students get excited about reading and writing again. All libraries should have picture books in them. They are not just for little kids. Tell us some successes you’ve had using picture books with older kids. I think the community that picture books allow us to have speaks for itself. In the beginning, kids goof off as a way to show that they are too cool to be involved with a picture book. But then, as the year progresses, they settle in and get really quiet and this hush comes over the room where all they care about is what will happen next. Picture books are the pillars of our community and are often talked about as we go through the year. Often, the kids remember the picture books we have read more than the projects we have done. If a child is having a rough day, I will often steer them toward our picture books to give their mind a break. After a while, they grab them themselves, knowing this is a chance for them to reset their thinking. We also create our own non-fiction picture books for young students and share them with the world, so that also gives legitimacy to the students as far as how much work really goes into language development and creation of something that appears simple, but is not. Which four or five picture books have been most popular with your students? Are there certain characteristics that your students seem to appreciate in picture books? My students love Elephant & Piggie — we act out the books late in the year. They love silly books with amazing illustrations, but are also drawn to the ones with a message. The North Star by Peter H. Reynolds is a favorite, as is Unicorn Thinks He’s Pretty Great by Bob Shea. Our favorites change every year, it seems, but there are always a few authors who come up again and again, such as Jacqueline Woodson, Peter H. Reynolds, Jon Klassen and Ame Dyckman. And, a bonus question: How many picture books do you have in your classroom at any one time? Hundreds. It is an obsession for me to get as many great books in the hands of my students as possible, and that includes our picture books. I also typically do not let students check them out, only because they tend to get lost easily. However, I am known to make an exception when a students feels someone at home really needs to know this story. See how awesome Pernille is? 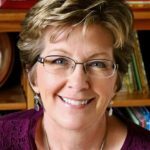 She’s even written another blog sharing her five reasons picture books belong in every classroom. Pernille Ripp, helps students discover their superpower as a seventh-grade teacher in Oregon, Wisconsin. 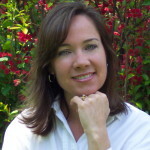 She opens up her educational practices and beliefs to the world on her blog www.pernillesripp.com and is also the creator of the Global Read Aloud Project, a global literacy initiative that, since 2010, has connected more than 600,000 students. Her first book will be republished this fall by Routledge titled “Passionate Learners — How to Engage and Empower Your Students.” Her second book “Empowered Schools, Empowered Students” was published in 2014. Pernille’s work has been featured by Edutopia, School Library Journal, MiddleWeb, Learning & Leading magazine, as well as in many podcasts and interviews. She is a Skype Master Teacher, as well as a Microsoft Innovative Educator Expert for 2015. She is the WEMTA Making IT Happen award recipient for 2015, as well as the 2015 ISTE Award for Innovation in Global Collaboration Award recipient. She teaches others how to give the classroom back to students through speaking and professional development. 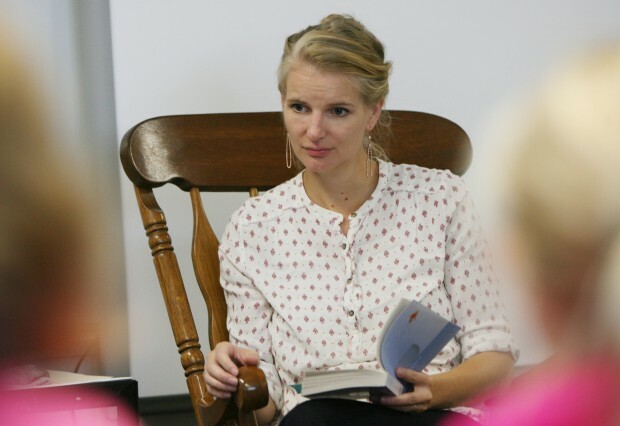 Follow her on Twitter — @pernilleripp. How many picture books will you read during the school year? Which ones are on your to-be-read list? How could you introduce them to nontraditional picture book readers? classrooms, Pat Zietlow Miller, picture books, teaching. Bookmark. Very interesting. Far reaching connections made while reading and sharing books. Thanks for posting this interview and links. Good for Pernille! I love reading stories about great teachers. Oh my gosh. I LOVE this! Her students are truly lucky they have her as a teacher. Love this! I used to use picture books in my 9th grade classroom. They were sort of a common-denominator and great scaffolding tool. The school I taught at most recently brought kids in from 31 different middle schools. Using a picture book (Jon Klassen’s THIS IS NOT MY HAT, for example – to teach dramatic irony) allowed me to catch all students up on literary terms in a fun and quick way. I love what Pernelle is doing and I think it’s awesome that she’s here, in our own state of WI! I love this! I used to be a Special Education teacher for grades 5-8 in a self contained classroom. I always did units on picture books. Many of my students were never exposed to picture books when they were younger…it gave me an incentive to make sure they didn’t miss out on such a rich and important experience…and of course, I got to share all my favorites from when I was a child too. Love this post! 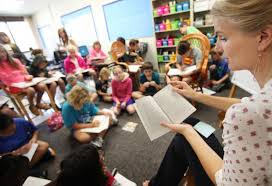 As a reading specialist, I’ve often presented at state reading conferences demonstrating ways to use picture books as a springboard for writing activities. Thank you so much for sharing this post! And thank you, Pernelle, for all that you are doing to build and foster a reading community. Your students are most fortunate! This is a fantastic idea and will do all Pernille said. It will definitely give the students foundations for writing and the joy of reading. I hope this becomes something all upper grades do. Wouldn’t that be fantastic. Wonderful and inspiring post, Jill! Thank you for introducing us to Pernille and sharing her use of PBs in her classroom. I will pass along to the middle school educators that I know. Fantastic Post! Thanks for introducing us to this inspiring teacher. I love knowing that picture books are being read to middle schoolers. A friend just told me how she reads one to her college students on the first day of class. Imagine if they were read at big corporate gatherings . . . or to Congress. Very happy to meet Pernille here. Thanks, Pat. Thanks for sharing this, Pat! Her students are very lucky indeed!! What a rich learning experience picture books can be for any age — thanks so much for this post, and for the amazing work you are doing, Pernilla and Jillian. I’ll be sharing this! Wonderful. Because picture books are so tightly crafted, they’re invaluable for offering ways to show character development through plot choices. That’s why I used them with my college students. Great post! What an inspiration! Go Pat! Go Pernille! Please keep talking about this. I have a 9 year old who still loves picture books. I don’t like her to feel forced into reading only chapter books yet…when she’s still enjoying picture books too. One problem with chapter books is that the themes and level of drama often isn’t her cup of tea. With picture books, she doesn’t have to worry about mounting conflict that takes her emotions to places she’s not ready to explore. I’ve got a really tender kid. This inspires to keep writing stories targeted for more than the 5 year olds. The current trend of books for 5 and under has stripped the beauty in many potential stories. I’ve read so many books resulting from this trend where I wish there was more ‘meat on the bones,’ richer descriptions and more depth. If the use of picture books can be expanded toward the older readers with so much success, perhaps we can get back to the deeper, richer stories. Thank you for sharing this information. I will pass it on to my community of teachers!